CyberPowerPC has teamed up with Western Digital to gift a couple of their fans with amazing SSD’s! 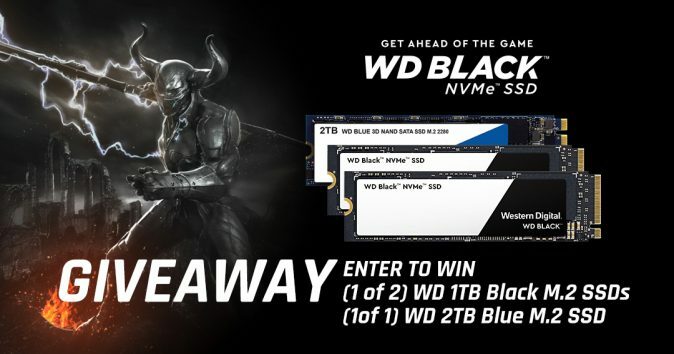 To enter in this Western Digital Black And Blue SSD Giveaway grab your free entries by following few simple steps listed down below! The SSD for those who are relentless. Fearless. Ruthless. Featuring sequential read speeds up to 3400MB/s (500GB and 1TB models), the WD Black NVMe SSD is where blazing speed, top-tier performance, and Western Digital 3D NAND technology combine. With up to 600TBW (1TB model) and 1.75M hours MTTF, it’s the virtually invincible SSD for gamers who have no time for mercy. Eliminate boundaries with Western Digital’s new vertically integrated SSD platform. This innovative storage architecture features Western Digital 3D NAND, and is optimized resulting in low latency, power efficiency, and compatibility with the growing range of applications benefitting from NVMe. Not known how winners are going to be contacted, probably by email and announced in giveaway widget shortly after giveaway ends.